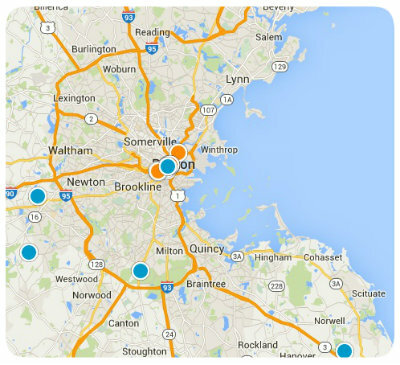 Bordered on the north by Wollaston, on the south by South Quincy, on the east by Quincy Center and on the west by Milton and the Blue Hills Reservation, the Quincy, Massachusetts neighborhood known as West Quincy, is a great place to buy a home. Unlike other parts of Quincy, West Quincy isn’t as densely populated, but it has just as many wonderful amenities for its residents to enjoy. Major thoroughfares in West Quincy include Adams Street, Quarry Street, Copeland Street, Willard Street and Furnace Brook Parkway. I-93 also runs through West Quincy, giving residents an easy way to travel to neighboring communities. Additionally, West Quincy is served by the MBTA bus routes 215, 238 and 245. Students in West Quincy are served by Quincy Public Schools, a district comprised of 11 elementary schools, 5 middle school and 2 high schools. Not only does Quincy afford its residents great educational opportunities, but it is also home to great recreation, shopping and dining options. Quincy, known as the City of Presidents, also has a rich history preserved in several great museums and historical sites. Additionally, Quincy is home to multiple beaches, acres of gorgeous parks and abundant opportunities for recreation and entertainment. Homes for sale in West Quincy and its neighboring communities vary in size, architectural style and price. If you would like to buy a home in West Quincy, or you have other Quincy, Massachusetts real estate questions, please do not hesitate to contact us today for more information.